Fifteen-year-old Boaz is the new Zar, freshly ascended to his throne. In the turmoil following the old Zar’s death, courtiers jostle and conspire to secure their positions – not least his scheming mother, the new Valide. It seems his only genuine friends are his late father’s mad jester; Spur Lazar, head of Percheron’s security; and a golden beauty – a new odalisque purchased in the foothills as a slave for the harem. But can a madman, a soldier and a concubine be trusted to keep him safe from the Byzantine manoeuvres of his father’s ambitious entourage? Pleasure and politics collide in Fiona McIntosh’s exotic new fantasy trilogy, set in the harem of the great Stone Palace of Percheron. I love the small little discount book shop in Charing Cross; sometimes I come across the best deals. In this case, I found all three books of Fiona McIntosh’s Pecheron trilogy for only £12 (all three together, that is). Bargain! I had tried one of McIntosh’s other books (Myrren’s Gift, to be exact), but I never finished it. Not sure why, cause I loved her writing and characters. Enough at least, to have no hesitation at all to buy this other trilogy of hers. I’m glad I did, cause it’s a great series. 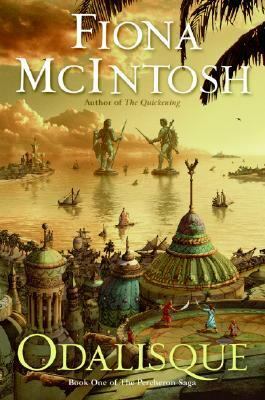 I haven’t finished it yet, but so far all McIntosh’s books has something unique about it. Each world she creates, with its own mythology and rules, feels special and fresh, making me want to find out more about it. Instead of the familiar repeated fantasy setting of a medieval type kingdom, Odalisque is set in an Eastern realm with a Zar and a harem (apparently inspired by Constantinople). This sets an original backdrop to the rest of story. The way the harem scheming and intrigues work are again different than what you’ll see in your standard medieval “political” novels. Besides that, there’s the addition of gods to the story, but again in a way I hadn’t seen before. I think it reminds me the most of Wheel of Time where characters are reincarnations of past legends/myths; here something similar happens. In Pecheron the story goes that every thousand years Lyana the goddess is reborn. Before she is revealed the owl god Iridor returns, as messenger and herald to Lyana. At the same time, the demon Maliz also comes into being, sent by the male god Zarab, to destroy Lyana. For the past couple of cycles, Lyana has each time been destroyed, and Pecheron only believes in Zarab, with Lyana remembered only as an bygone remnant of another era. Of course, this series is about the rebirth of Lyana, Iridor and Maliz, but the cool thing is that when the book starts you have no idea who is who and neither do the characters. You slowly get your own ideas, but even at the end of this first book you’re still not sure if someone is a “god” or just a random human. I’ve got my suspicions on how this series will end, and I’m really curious to see if my intuitions are right. I’ve already dug into the next book of this series, and can’t wait to find out more! 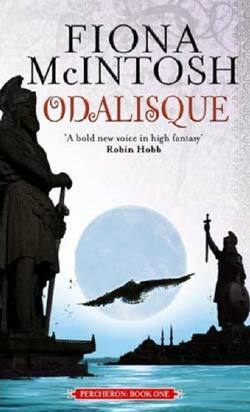 Definitely a recommended read to anyone who’s a bit bored by the standard medieval fantasy fare.